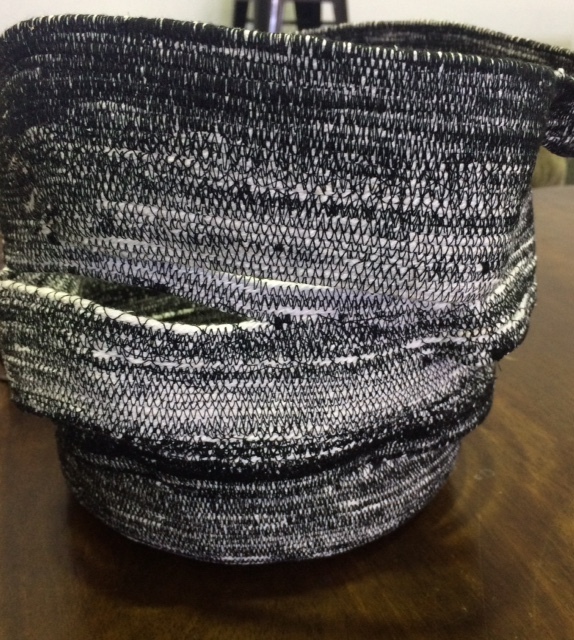 Did you see Treena McArthur‘s beautiful wrapped, coiled and stitched baskets in the “Black and White” exhibition? This month Treena will share her technique, and we will make a small table mat with her guidance and instructions. > One and quarter inch (three cm) wide strips of cotton fabric. You will need many metres of strips - either cut on the bias or straight grain. The bias gives a smoother finish, and the straight grain may result in a more “fluffy” edge. Both look great! As usual, the workshop cost is $10 per person. If this is not your thing, there will be opportunities to work on your own project, work on a piece for the Stitches and Craft Show, chat with friends and browse our library . Please bring you own cup and wear your name tag. In the afternoon (both Saturday and Monday) Wendy Anderson will be available for garment making tips and techniques. I learnt so much from just one afternoon last month, I will be back again on Monday afternoon to practise the fantastic tips Wendy gave us about making sure your garment sewing has that well finished professional touch. Thank you, Wendy for this generous offer of your time each month. Apologies, I will be attending a conference on Saturday 16 March, so Sandra Cooke will be coordinating Saturday’s activities. Please note : both these workshops will be repeated on Monday 18 February. 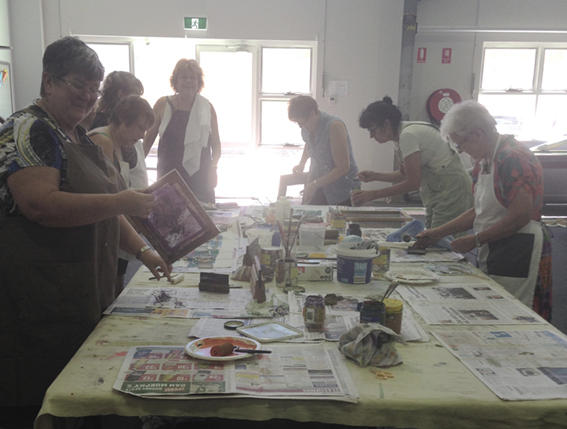 The Monday group is also working on garments made with recycled tea towels or other table linen. Rhonda Porter will show you how to make a simple kumihimo braid made on a foam disc with thick yarn (these will be provided as a kit for this workshop). Please bring a pair of scissors and a tape measure. The kit will cost approximately $5. As usual the cost for the workshop is $10. At the Saturday meeting, we will also discuss further the 2019-2020 exhibition which has now been redefined by the NCEATA committee to Cosmic Dreaming . . . please see the separate information on page 2 about the Exhibition. For those who do not wish to participate in the workshop, there will be plenty of time and opportunity to browse the library, chat with friends and work on your own projects. Please wear your name tags, bring a cup/mug for tea or coffee and perhaps a small plate of food to share for morning tea or lunch. Saturday afternoon extra: Garment making problem solving, tips and techniques. 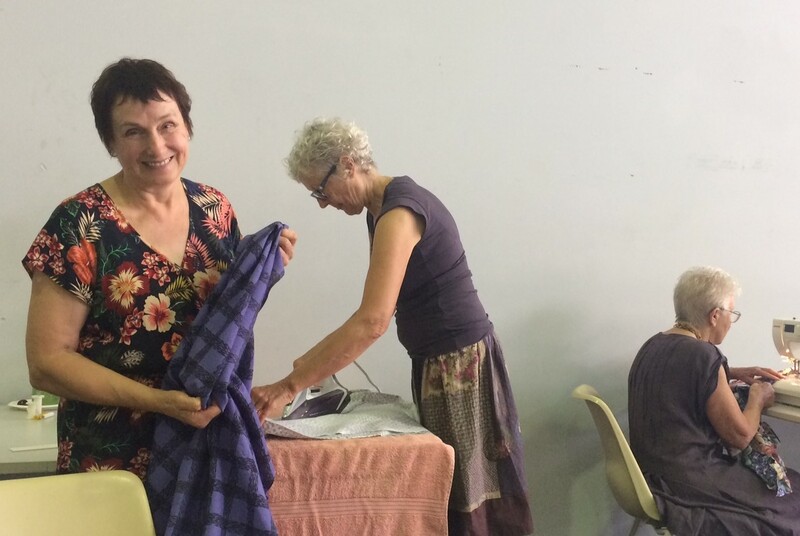 Wendy Anderson will conduct garment making sessions after the main NCEATA meetings on Saturdays and Mondays - approximately 2pm - 4pm . This is a session where you can bring in patterns and fabric and make a garment with Wendy’s advice. This is not a basic sewing lesson and it is not a pattern drafting lesson. The idea came from Jo Green who asked if NCEATA could conduct some short workshops on giving a professional touch to your garments - the extra tips and techniques which Wendy is able to offer from her training and teaching experience at TAFE. It is hoped that these additional workshops could continue most months if there is sufficient interest. Cost is $10. Please bring your own pattern, fabric, sewing kit and sewing machine. This technique will give you a long roll of bias that is perfect for a particular project or on hand for possible use in later work. Judi has a large stash of unusually patterned continuous bias of various widths and sometimes uses them without even folding them under because they do not fray. > FABRIC SQUARE: Choose your fabric with your chosen colours and patterns which will be better without a nap and not too thick, probably the smoother the better, but there are no rules. Your fabric piece needs to be as long as it is wide to get a perfect 45 degree on the bias. > THREAD: The colour should blend in with the colour of your fabric. > RULER: Choose your bias width which should include the fold width on each side. Make a ruler length strip of cardboard the exact width of your desired bias. > PEN: Bring something to draw a line on your fabric using the cardboard strip so whatever you choose to draw with must show up as a line on your chosen fabric. You may use chalk, pencil, permanent fine marker etc. > SCISSORS: Sharp scissors are the best for cutting the bias strip. > A sewing machine and iron are necessary but we only need a few. > A toilet roll or large empty reel are useful for rolling the cut bias on to. Judi stores her bias as a flat ribbon and only folds it as she uses it. Welcome back! This year we look forward to more exciting experiences as we learn new techniques. Continuous bias will be our main focus, as per Saturday’s meeting information above. For members interested in making a top for the Sustainability Festival in September, we could start by sharing patterns of a simple style... ie extended sleeve, no button opening etc. If you have any, bring them along, with your ideas for adapting them and fabric to include a recycled tea towel in the mix of recycled fabrics (not needed this month). 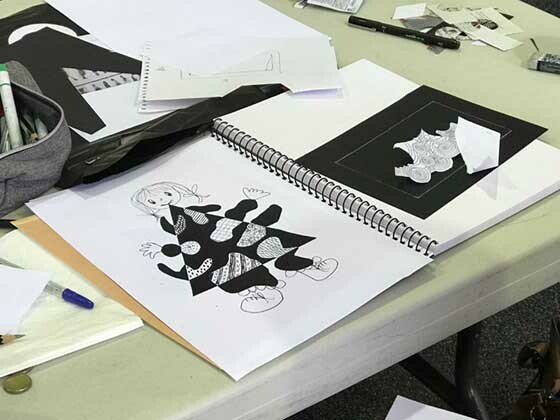 Bring along paper or interfacing fabric and a pencil to trace off any patterns you feel might work for you. For members not wishing to do any of these activities, bring along your own projects to continue over a cup of tea. Don’t forget your cup, and name tag. Can you believe this will be our Christmas meeting? We will have a shared morning tea and lunch - please bring a small plate of food to share. If your surname starts with A-M it would be appreciated if you brought something savoury, if your surname starts N-Z, something sweet. This is just a suggestion so there will be a balance, not mandatory. Because of all the wonderful work done for our Black & White with a Twist fund raising quilts, there will be no Charity draw this year (usually $5 per person into the hat). Our guest will be Claire Stuckey (Marion’s Treasures) who will talk about her mother’s amazing collection of vintage buttons, buckles, beads, fabrics and all things textile and embroidery. Claire will also have many items for sale, so this is a great opportunity to buy a unique gift for family and friends who will appreciate vintage treasures. Claire is from the Central Coast and while she cannot bring everything, if you have a special item you think she might be able to provide, please contact me at least two days before the meeting and I will send on your request. I will also be collecting exhibition items and paperwork - please see separate email with the exhibition Black & White requirements form attached. Merry Christmas and thank you for all your support during the year. Christmas Meeting - shared morning tea and lunch, as per information for the Saturday meeting. 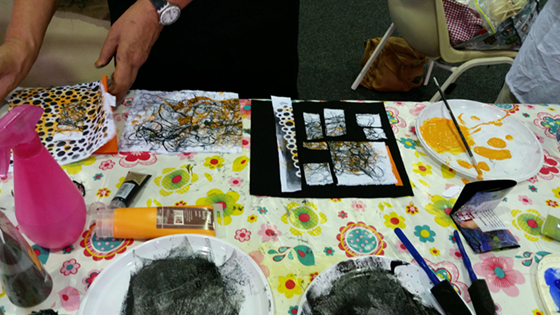 At a member’s request, Wilma will demonstrate photo transfer on to fabric with marker pen or orange power or sticky tape. As she has done this before, this will be a very short session so there will be plenty of time for chatting, show and tell and the collection of Black and White Exhibition art works. Exhibition pieces are now complete so there will be time to share ideas for Christmas decorations, gifts and even quilts. Members of the Manning Fibre Artists led by Pat Davidson, a previous NCEATA president, will be sharing their ‘suitcase” project with us at both meetings. There will be different artists at the two meetings so members are welcome to come to both meetings as the discussions will be different. MANNING FIBRE ARTISTS started late in 2012 at the suggestion of Sue Mitchell, the then Director of the Manning Regional Gallery. 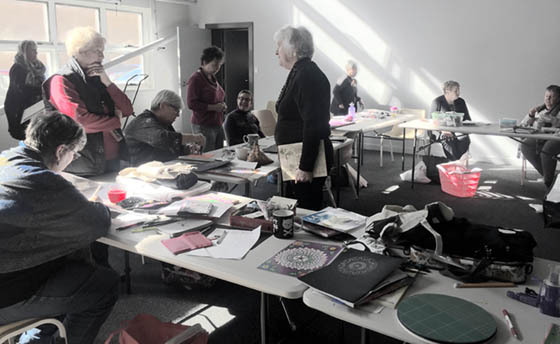 Meeting at the gallery for workshops and the general sharing of ideas and practice, the fibre artists planned a group exhibition from the outset and ‘Transition’ took place early in 2015 at the MRAG. Originally a band of friends who already knew each other slightly from TAFE days and similar activities, the membership has grown, changed over time and consolidated to become a force of around sixteen enthusiasts (both beginners and experienced) who meet irregularly to support each other by ‘showing-and-telling’ the results of their individual studio work. ‘A Sense of Place’ (2016) was their second exhibition which toured Tamworth Regional Art Gallery, “A Little to the Left” gallery in Taree and the Great Lakes Art Society, Foster. The ‘Suitcase Project’ was developed to introduce the Manning Fibre Artists to other like-minded groups with a view to sharing our art practice. In this mini workshop we will complete a small (A5 size) piece based on the style of Japanese quilt artist Noriko Endo. In Noriko’s amazing landscape quilts fabrics are cut into confetti like pieces, scattered and arranged on a background, covered with fine tulle and heavily stitched. A foreground layer is added, more tulle and more stitching! Finally she will add some paint to create interest and detail. 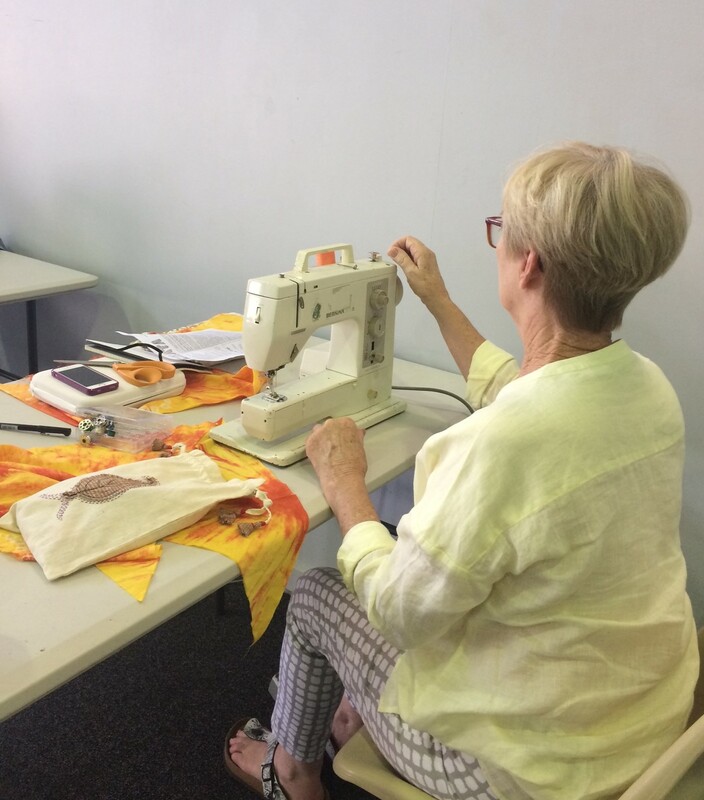 • Sewing machine capable of free motion quilting - also needed a few power boards/extension cords to accommodate machines. • Polyester machine embroidery threads are recommended but for our exercise any machine threads will do – basic black/grey plus colours if you want to get adventurous. • Rotary cutter and mat if you have them – if not we will share. • Basic sewing equipment – pins, scissors. A kit containing fabric, backing, tulle is provided. Please bring a small plate of food suitable for a snack on the fly, your own mug and wear your name tag to welcome all our new members. The fantastic squares created by NCEATA members are now being made into quilts/wall hangings. Already a skilled design team has prepared the squares and started joining them during Carolyn’s working bee but there is still more to do. During this meeting there will be work for a few willing helpers to stitch and quilt. What will be needed are: sewing machines with black thread, cutting board and rotary cutter, ironing broad and iron and quilters pins. Carolyn will provide backing and wadding. For members not wishing to do any of the above activities, you are most welcome to bring your own projects, enjoy the company and chat over a cuppa. Bring any unfinished work especially black and white work for our upcoming annual exhibition to work on while networking with like minded friends. Don’t forget to also bring along what you have made or are currently making for show and tell, your mug and something yummy to eat. The committee meeting will be at 9am on the Monday. We must fill the Monday Coordinator’s position during the Monday meeting. This position can be shared by two. Monday this month is a repeat of the Saturday meeting. Very important meeting: the Annual General Meeting will begin at 10am on the Saturday. Come along and hear the annual reports and plans for the future of NCEATA. Please consider taking a position, or at least volunteering to assist the elected committee member. Descriptions of the committee positions are in this newsletter and please note that many duties are to do or TO DELEGATE. We need YOU to continue to make NCEATA as active, relevant and creative as it is and has been. After the AGM... If you do not wish to do the scheduled workshop, there will be time for you to chat with NCEATA friends, complete one of your own projects, share informally, browse the NCEATA library or just enjoy a cuppa. Annette and Roberta will introduce us to the wonderful world of stitched mandalas. 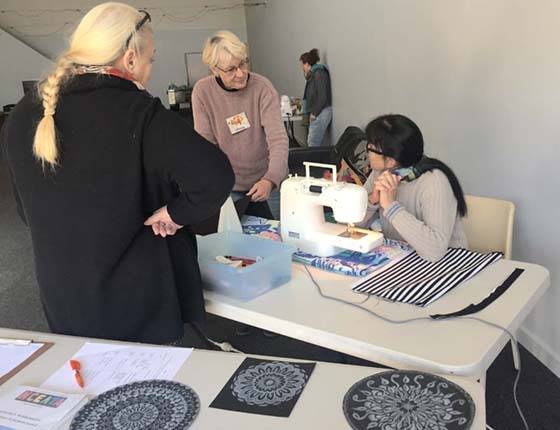 In this workshop you will learn the techniques that Annette uses to create embroidered mandalas. Roberta will be doing an exercise in designing your own mandala, a workshop she did several years ago that inspired Annette. > Pierce of black homespun – approximately 12” square. But don’t buy fabric if you don’t have any in your stash. I will have some. > If you have a favorite book of embroidery stitches, you may like to bring it as a reference for possible stitches to use. Meeting workshops are $10 per person. 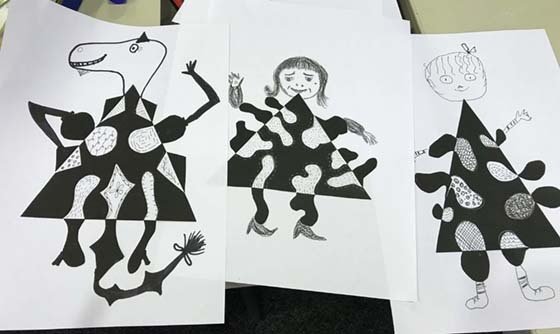 Many thanks to Doris, whose Black Work workshop was very engaging and well received last month. I am still stitching black work beetles . . . .
Proposals for this year’s Black and White exhibition are due this month, along with your black and white with a twist of orange squares for our display at the craft show in August. For this month everyone should bring along an idea, technique or other information such as a textile artist we would be interested in, a book/magazine or a cool you tube video to watch to share etc for a group demonstration day. I will take notes and put all the information together, so get your thinking caps on. Don’t forget to also bring along what you have made or are currently making for show and tell, your mug and something yummy to eat. There will be no committee meeting this month. See you there, with my boys too, school holiday time. Keep warm. Doris will be introducing the many possibilities of Blackwork embroidery this month. Blackwork, sometimes historically termed Spanish Blackwork, is a form of embroidery generally using black thread on white/cream fabric, although other colours are also used, especially in contemporary work. It is counted-thread embroidery which is usually stitched on even-weave fabric. Doris will lead us in creating a small blackwork sample, which will, no doubt, inspire you to explore the technique further. > A table light and magnifier if you need one. > A good sense of humour ! Doris will have materials if required. Many thanks to Barbara Rowe who opened up the room last month, while I was on retreat and to Lee-Anne Deegan for her organisational support. COMMITTEE MEETING STARTS 9AM MONDAY This will be held each month before the 10am Monday general meeting and workshop. URGENT CALL OUT for a member to open up the room for the May Saturday meeting. I am looking for a NCEATA member to be a Saturday coordinator for a day. Most of the committee and I will be at the NCEATA retreat on the weekend, 18-20 May, so I am looking for a member to be responsible for opening up the room and closing up at the end of the meeting, please. President Carolyn has a key and will organise for you to have it for the weekend. This meeting was planned to be a “do your own thing” meeting, with members working on their own projects and enjoying one another’s company, so there will not be a workshop to organise. Please wear your name tag and bring a small plate of edibles for us to sustain ourselves with. Looking forward to a great workshop. There is no demonstration or workshop this month so come along and bring the following and enjoy the day. > Items for show and tell. > Your Black, White with a twist of Orange to work on for the Stitches and Craft show. > Any handy hints, questions someone may be able to help you with, information on upcoming events/classes that members might be interested in etc. > A plate of nibbles to share and your mug for tea/coffee. See you at the monday meeting. During this workshop we will be removing (discharging) the colour from supplied hand dyed black and coloured cotton fabric. Discharge agents that give a hard edge to your designs are very toxic and should only be used with proper gas masks so we will be using bleach which is far less toxic and will give us soft edged discharged patterns and prints.You may also bring your own fabrics but be ready to be surprised because some colours especially blacks do not discharge very well and sometimes not at all. Do not wear anything that you love because bleach and good clothes do not mix. Judi will provide the fabric and all the materials for experimentation in this workshop but you are welcome to bring your own. 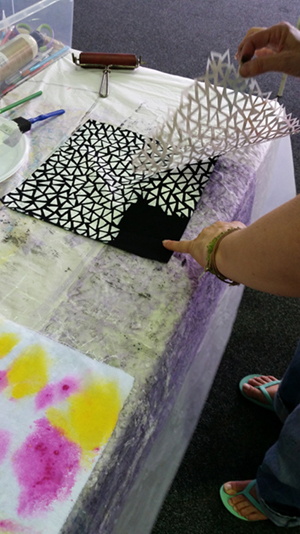 You will be able to create interesting black and white fabrics for use in potential work for this year’s annual exhibition. Please wear your name tag and bring a small plate of edibles for us to sustain ourselves with. Looking forward to a great workshop. I hope you enjoyed the design exercise last month with Wendy Anderson. Thank you, Wendy. This month, we will be exploring an easy way to interpret the black and white theme in simple patchwork. Catherine Bremmell will be leading a patchwork activity at this meeting for both beginners and experienced stitchers. I am sure this activity will inspire you - have a great time. Sadly again I will be missing this as I will be teaching at Grampians Texture. We will be very fortunate to have Wendy Anderson lead a mini workshop in design on 17 February, 2018. 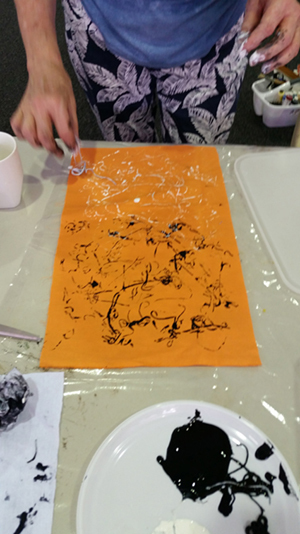 Wendy has planned 3 or 4 design exercises relating to Black and White, depending on time and these will help you prepare your textile art work for the NCEATA exhibition. Please bring, paper scissors, glue stick, compass if you have one, ruler, drawing utensils eg, black and white colour pencils, black drawing pens, gel pens, lead pencils, chalk crayons etc, eraser, sharpener. Don’t buy anything especially just bring what you have, as Wendy will have extras. Please also bring a couple of magazines that you are willing to cut up, eg Vogue, Women’s Weekly etc and some coins 20 cents, 10 cents, 5 cents $1 and $2 for drawing around, easier and quicker. Wendy will supply white paper and black board and some photocopies for your exercises. You will be transported back to your early childhood days of cutting and pasting. Hope you are all looking forward to having a fun day. Apologies, I am not able to attend this Saturday, as I have a Rotary training day in Sydney re: Child Protection following the recent Royal Commission. Carolyn, our president, will coordinate the Saturday meeting this month - thanks Carolyn. Photos below are of the workshop in progress. Linda will also have these items to share if you do not have something. Let’s have some fun doing a few different painting techniques on fabric, creating your own unique designs to use. Photos below are of the workshop in progress. Welcome back to NCEATA in 2018. This meeting will be a gentle but inspirational beginning to the new year. Besides catching up on all the creative activities members will want to show and tell, we will be treated to a “show and tell” extravaganza. 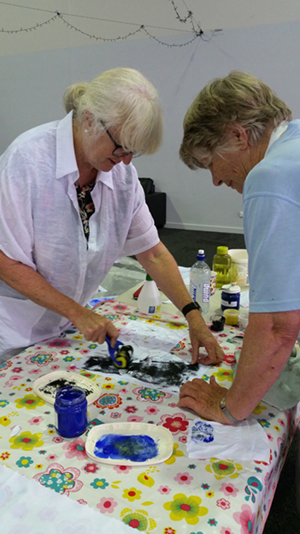 We welcome one of our newer members, Lyn Adamson who will share with us her experiences at the Quilt Symposium and Workshops, recently held in New Zealand with about 900 participant textile artists. 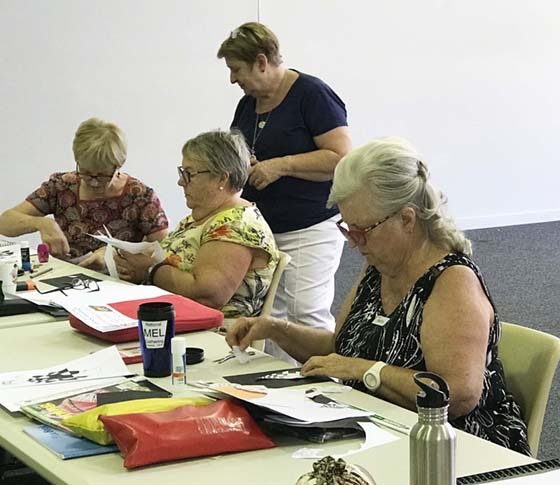 We will also be inspired by our own treasurer, Sue Russell who will talk about her Creative Embroidery Correspondence Course with the Embroiderers’ Guild of NSW. I am looking forward to hearing both of these presentations and I am sure you will be motivated by their enthusiasm and talent to try something creative yourself. Please bring your own project to work on - nothing is needed for Lyn’s and Sue’s presentations. Please remember to wear a name badge and bring your cup for tea or coffee which is supplied by NCEATA. PS : Lyn and Sue will also be at the Monday 15 January which this month is before the Saturday meeting. Making fabric twine or rope is “scrapbusting” at its best - colourful, meditative and mildly addictive. 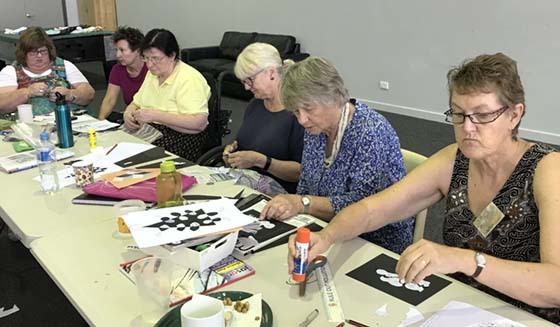 We are not sure if this is what Angie Parkes had in mind for our November meetings, but this is a very quick, easy and useful activity which will be led by Narelle Sheahan and Wilma Simmons as Angie is not available. This twine has lots of uses, and we will explore ways to use it creatively. November meetings - please bring your exhibition work for The Nature of Things” - Maria will be collecting all work, and hopefully, you will be able to have a sneak preview! The November meetings are our Christmas meetings, so please be festive! A small plate of food to share is always appreciated. Please bring your own cup for tea or coffee (provided) and wearing your name tag helps new members and guests. PS: As mentioned in the last newsletter, on Saturday, Roberta will be accompanied by a friend who has embroidered samples and handmade items for sale, made by women in other countries. This experimental workshop will use various layers of fabrics and a method that gives you fluffy, textured “chenilled” fabric. > Various weight fabrics:- Eg. chiffon, organza, silks, muslin, cottons and linens. Metallics, flannelette, rayons, synthetics in all weights, even try pellon and tracksuiting, old soft woven scarves (damask/brocades with their tapestry weave wouldn’t usually be used, but give them a go). As the completed fabric is usually washed and scrubbed to fluff it up, fabrics that shrink or colour run will need to be considered in your planning. > Stiff bristle brush (nail brush). Chenille is the French word for caterpillar whose fur, the yarn or chenille effect is supposed to resemble. The chenille effect by ragging the seams, has been adapted by textile artists A quilt with a so-called “chenille finish” is often known as a “rag quilt” or, a “slash quilt” due to the frayed exposed seams of the patches and the method of achieving this. Layers of soft cotton are batted together in patches or blocks and sewn with wide, raw edges to the front. These edges are then cut, or slashed, to create a worn, soft, “chenille” effect. The cost of this workshop is $10 per person. If you do not wish to participate in the workshop, you are very welcome to bring your own project, or quietly chat with other NCEATA members and enjoy the day sharing ideas and enjoying great company. Bring a small plate of food, your own coffee cup and wear your name tag please. Boro is a centuries old Japanese method of mending textiles, both household items and clothing. While it’s origins were based on necessity (mottaini!) Boro enriched items are beautiful and have become very fashionable over the last decade. The only equipment needed is a darning or sashiko needle (long needles with a small eye), pins, sashiko thread, although embroidery thread is fine, a ruler and fabric chalk (optional), fusible webbing (also optional), scraps of fabric, a base fabric or textile item you want to mend or embellish. Bring a small plate of food, your own coffee cup and wear your name tag please. Don’t forget that this is the same weekend as the Stitches and Craft Show. We are having a boro show and tell. If you could, please bring along items you have used with boro stitching. This will also be a play day with fabric and threads. Ladies need to bring usual sewing gear i.e. scissors, needles, threads and scrap fabric (see fuller list for Saturday’s meeting). Roberta will have scraps plus calico and threads. There will be optional generous scrap and thread bags for $5. Bring a small plate of food to share for lunch and your own ideas to share, ideas for small bags, book covers or coasters. This month is the deadline for proposals for our annual exhibition: The Nature of Things. Please use the formatted form which is attached as a Word file that you can type into and also import your photo into before printing for hand delivery at one of the July meetings or emailing directly to exhibitions@nceata.org. IntoCraft Show is in August and we will be working on the creation of leaves. The July workshops will kick start a portion of our display. If we get a good number started it will give IntoCraft visitors a lead in so they can finish them at the show. Along with pre-cut templates of a mixture of leaf outlines, I will have some acrylic felt, some Bali fabrics and some plains too. I’ll bring Shiva sticks, and painting equipment. Bring along your general sewing equipment and maybe some scrap fabric, beads, ribbons, lace, etc. to create a few interesting designs. You may wish to use the NCEATA embellisher so wool yarn, roving and fabric may be able to find its way into your bag. If you’d like to machine sew you’ll need to it bring along. A power board and extension cord never go astray. Bring a small plate of food, your own coffee cup and wear your name tag please. Column 1 on this page gives a list of NCEATA activities for the remainder of 2017. Possible short workshops for Mondays are still welcome. Our year has passed quickly with many things learned and lots of social chat. A big thank you to all of you for your contributions to our Monday meetings. Monday meeting coordinator is available for any person willing to take up the position. We will be using Polysol dyes which can be used on synthetic fabrics. They give brilliant, fast colours. They are easy to apply. Just paint or draw your design on paper then iron onto the fabric. It is non-polluting, safe and does not require either fixing agents or rinsing. The fabric remains supple and retains its original feel. The design can be applied by brush using water colour techniques, fine writing pen. Paper can be painted, then cut and woven or torn. If the dye is thickened, it can be used with printing with blocks or screens. (We will not be doing this thickening and printing.) We will be using liquid dyes and polysol crayons. The polysol dyes are suitable to print on synthetics such as polyester and nylon. The dyes have NO affinity for natural fibres, but fabrics containing at least 65% synthetic can be dyed - you will just get paler images. Do a test sample first to check that your fabric can withstand the heat from the iron. Gay will be demonstrating the techniques and using those who want to be involved to do the painting, cutting, rubbing, etc. > Scissors, cutting knife & board. > Pen, paint brush to draw with dye. 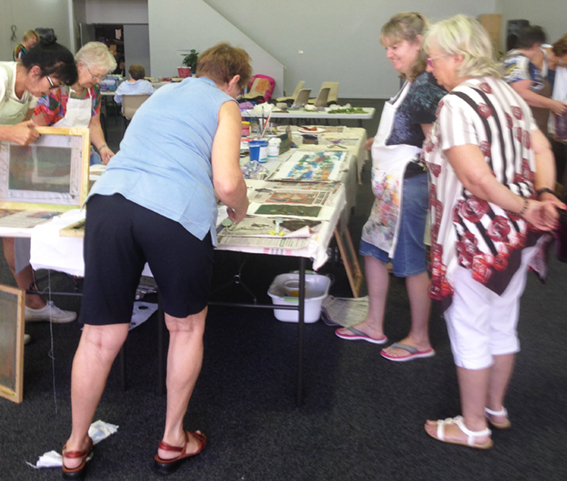 Thank you Wendy Scott for the great May Saturday workshop where members increased their creative textile repertoire using 3D flower forms. Gina specialises in wearable art, inspired and created with nature. This full day workshop will start at 10.00am and go to 4.30pm while exploring the basics of dyeing with natural substances. Cost to members is $55 plus $40 for a kit. The kit includes silk and wool fabrics for samples and a wool or silk scarf to dye, plus strings for bundles. Please contact Carolyn Clausen on email address secretary@nceata.org to book a place and then direct deposit the money in the NCEATA bank account using BSB - 650 000 and Account - 964 192 000 with Eco Class as the edger entry. > Few large jars eg passatta jars. Your own silk or wool fabrics. Wilma, our president, will be providing morning tea and lunch to accompany this workshop but extra snacks are also welcome. No meeting this mounth because of the clash with Easter. No meeting this month becasue of the clash with Easter. Saturday and Monday group, this will be a UFO day. If you would like some help or suggestions to complete a project, many ladies are willing to help. Wear your name badge, bring a small plate of food, to share with a cup of coffee. Bring along your work for show and tell. The group decided there will be no meeting on Monday in April, Easter Monday. Details for this meeting are the same as above for Saturday. Silk screen printing during this workshop will feature prints from Bob Seal’s three relief blocks. The process will incorporate many accidental affects and the final images will all be unexpected and intuitive. We will be using Permaset inks and reducer and talcum powder and other resist materials to produce the images on cloth. 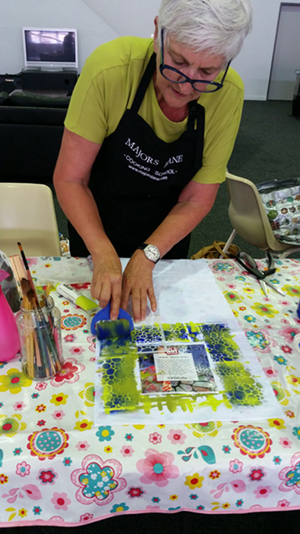 During this workshop you will have the opportunity to add a layer of dye paint once the print has been heat set with an iron for extra colour. Please bring your own screen and squeegee if you have them which will make it easier for me to run the class. I wish to apologise for spelling Bob Seal’s name incorrectly in several newsletters. I even incorrected his name in our president’s column. Sorry! Please wear your name tag, bring your own mug, a small plate of food and anything interesting you are working on for show n tell. Last month’s two meetings by Sandra Cooke were very well attended with interesting prints made as a starting point for work to be developed for our next exhibition. Sandra has very kindly offered to help me run the February workshops because she is afterall our silk screen guru. We will be printing from Bob Searle's beautiful set of three nature wood blocks which are the starting point of creative work for our next annual exhibition plus travelling suitcase exhibition. Please note that February's silk screen workshop will be working with the same images. We will need to limit print colours as washing blocks between colour changes damages the wood. Black printing ink will be supplied for all three. Bring any type of fabric to print on, even sheers over your cloth so that you get 2 identical prints in one go. Your prints will be heat set by ironing with a cloth to protect the iron and your print. Sandra has many prints already prepared to cut up for members who are not able to make their own prints. Wear old clothes. Gloves if you want clean hands. Dress makers chalk/marking pen and ruler. Tray and roller. old meat/ polystyrene trays are good. Foam roller from discount shop or hardware store. Fabric to print on. Anything and any colour. There will be a $10 fee for this workshop. Please wear your name tag and bring a small plate of food as usual. Please also remember that members' input is essential for organising the year's workshops. Please help your Coordinators by informing them of possible future workshops and anything textile you specifically want covered. Page last updated 5th March 2019. page views since 4th April 2011.